Dedicated to Prof. J. Normant on occasion of his 80th birthday. Sadly, Prof. J. Normant passed away June 9. Ethynylation and propargylation of chiral nonracemic polyhydroxylated cyclic nitrones with Grignard reagents are efficient methods for preparing building blocks containing an alkyne moiety to be used in copper-catalyzed azide alkyne cycloaddition click chemistry. 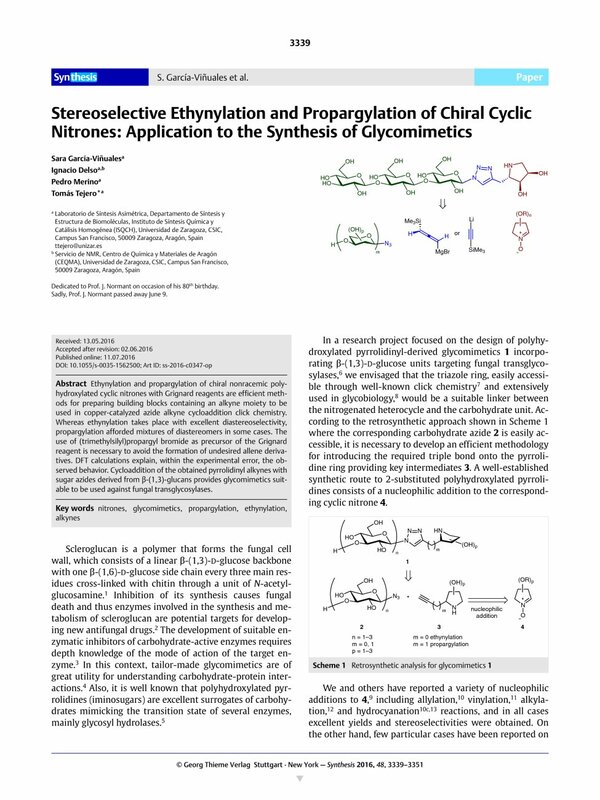 Whereas ethynylation takes place with excellent diastereoselectivity, propargylation afforded mixtures of diastereomers in some cases. The use of (trimethylsilyl)propargyl bromide as precursor of the Grignard reagent is necessary to avoid the formation of undesired allene derivatives. DFT calculations explain, within the experimental error, the observed behavior. Cycloaddition of the obtained pyrrolidinyl alkynes with sugar azides derived from β-(1,3)-glucans provides glycomimetics suitable to be used against fungal transglycosylases. Supporting information for this article is available online at http://dx.doi.org/10.1055/s-0035-1562500. 27 For full details on calculations, see the Supporting Information.